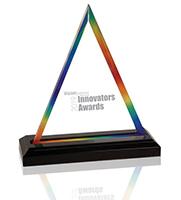 Today, AT – Automation Technology, innovator in the field of special imaging sensors, was presented with a bronze-level award in the product category “Cameras – non-visible” at the Fifth Annual Vision Systems Design Innovators Awards presentation, held during Automate in Chicago, IL, USA. 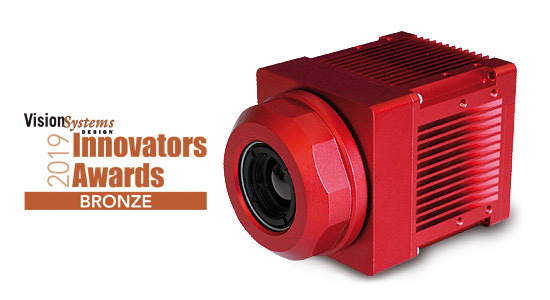 AT’s IRSX series of smart infrared cameras for industrial use was recognized by a panel of esteemed experts from system integrator and end-user companies. With AT’s IRSX series of smart infrared cameras, intelligent, self-contained thermal imaging systems that are consistently designed for industrial use are available for the first time. Designed as an all-in-one solution, the cameras combine a calibrated thermal imaging sensor with a powerful data processing unit and a variety of industrial interfaces in a small, rugged IP67 housing. A computer, special thermal imaging software, or external interfaces are no longer required. This considerably reduces system complexity, installation effort, and costs while significantly improving system stability. Thanks to the web-based configuration interface, the IRSX cameras can be set up for thermal monitoring tasks in no time without programming skills. The REST-API, implemented according to the OpenAPI standard, makes it easy to adapt the visualization for customer-specific applications. Users can create their “own website” or import the data supplied by the cameras into an existing website. The provided standard protocols Modbus TCP, Profinet, OPC-UA, and MQTT enable direct access to the evaluation data as well as a direct connection to the PLC and industrial visualization systems. With the Lua scripting integrated in AT’s standard smart apps, complete customer-specific evaluation scenarios can be put into practice. A growing number of application-specific app packages are available, such as an app for substation monitoring with a correspondingly optimized visualization and a SCADA protocol established in this area, DNP3. Here, too, customer-specifically adapting the visualization is possible via the REST-API. The camera platform is based on Gigabit-Ethernet with GigE Vision so that even larger sensor networks can be set up with standard network components. The IRSX series includes a variety of models with different fields of view, resolutions, and frame rates, thus covering a broad spectrum of applications in all areas of industrial process automation. Wherever temperature has a decisive influence in the manufacture and processing of products, the IRSX cameras provide a highly flexible solution for autonomous thermal monitoring. 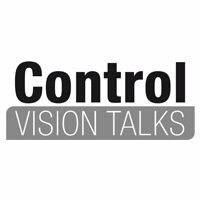 A further application focus is preventive early fire detection and plant condition monitoring. Once set up, the cameras automatically detect temperature anomalies and trigger an alarm long before a fire breaks out or a system fails.